I told you a couple of weeks ago about jumping on the Brickless bandwagon. Once I started this lovely pattern, I couldn't seem to stop. It was finished in 6 days, and it is enormous! Every podcaster and blogger who has spoken about this particular pattern has said that the resulting shawl is big, but I decided to add an extra pattern repeat to mine because I had so much yarn to spare. With hindsight I think maybe I should have saved the yarn and made some mitts, because it is nigh on impossible to take a decent photograph of this beast in it's entirety. This shawl is a behemoth! 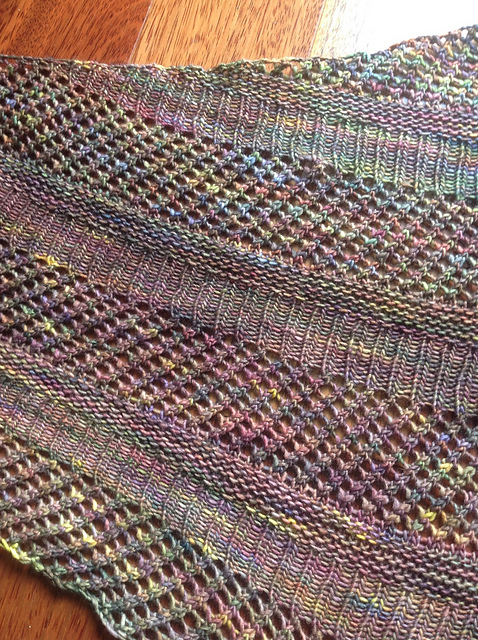 Despite the difficulties in photographing this shawl, it is nothing compared to the struggle I had to block it. 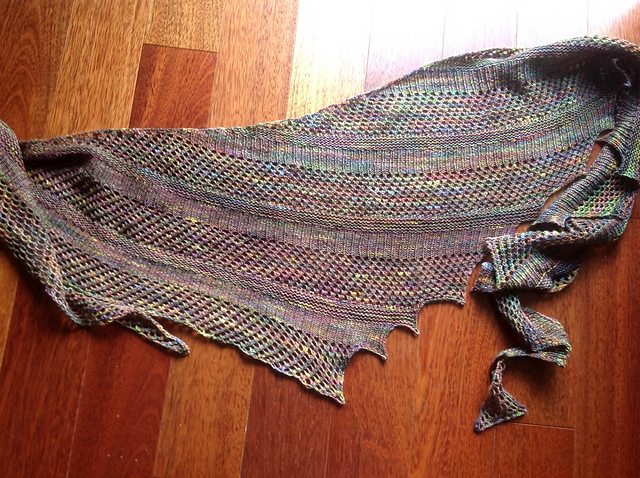 I wish I could have taken photos of it on my bizarre layout of foam mats, that followed the curve of the shawl. 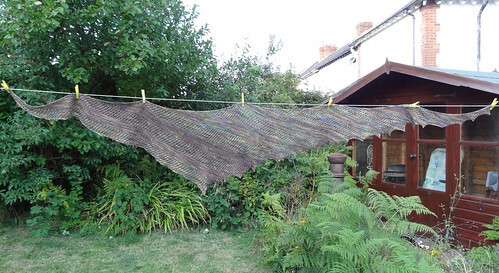 As the shawl was so large, the only place left for it to dry (I wet block pretty much everything) was leaning against the wall of the spare bedroom. I had to wait for my other half to come home from work to help me man-handle the boards without the whole thing collapsing. Maybe I should consider gaffer taping them together next time I do something so huge. Normally it's not much of an issue, and the interlocking mats stay roughly joined together, even when being stood up against the wall. This time, not so much. This was the layout. I think each mat is 18" square, so you can get an idea of the unwieldy nature of the beast. I have to say that the blocking and photographing was the hardest thing about the whole project. Knitting it was a complete dream. After the first couple of repeats you didn't really need to refer to the pattern except to check occasionally on the right number of stitches to increase or cast off. 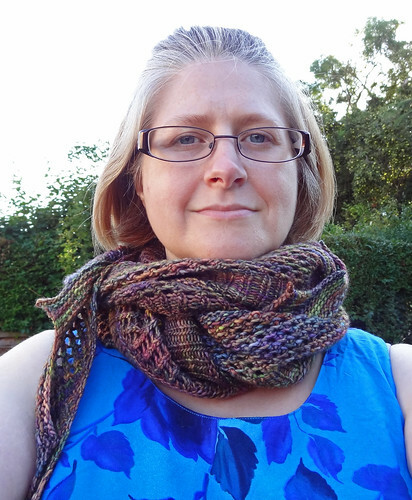 I loved working with this yarn and would love to use it again. After blocking, the lace and texture really popped out because of this lovely plump round yarn. I'm really pleased I chose this yarn, despite it being out of my comfort zone. Malabrigo Rastita is such soft and warm yarn, I wouldn't hesitate to use it again. The price point is a little on the steep side for me, but you do get what you pay for, and the yardage is ok. It is really hard to capture the complexity of the colourway, Arco Iris, but this photo gives you a good over all impression. I knew that this pattern was written with a highly variegated yarn in mind, so it was nice to actually try and hunt down something similar in the UK. I'm glad I did, because the yarn and pattern work really well together. I love how the right side and the wrong side are almost as interesting as each other. When the scarf is all wrapped up tight you get pops of colour and texture, and contrasts of points and smooth edges. It's a great design. Martina Behm strikes again! 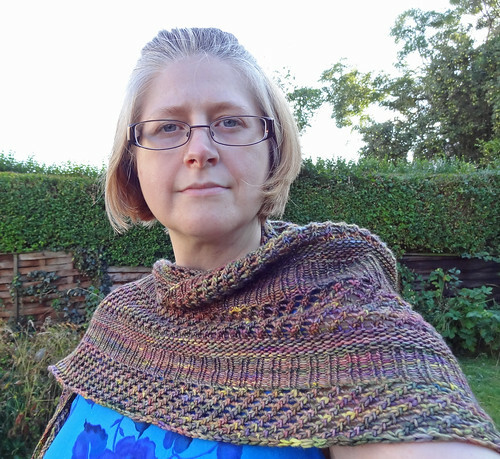 I really wish I could have got some nice arty shots of this shawl with a big overcoat and boots, but this has been a very warm Summer and it was hard enough wearing it for the brief seconds I did for these photos! I did manage to get my Brickless finished in time to enter two KALs. I know I didn't win the first one, but I still stand a chance with the second. However, the shawl is enough of a prize that I'm not worried about that. 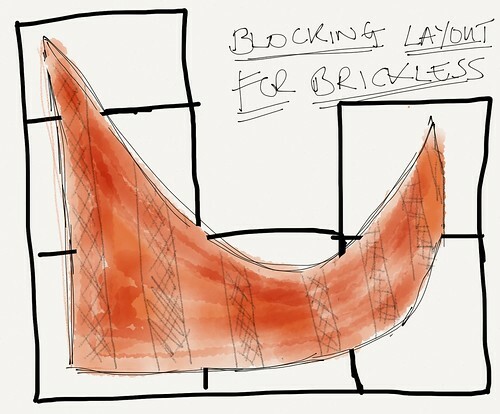 Over all, I recommend the pattern and I recommend the yarn, and I recommend the gaffer tape on your blocking mats, or find somewhere big and flat to leave them!